tokyo-based ryue nishizawa has completed the first of a series of structures at the kumamoto station east exit station square in japan. 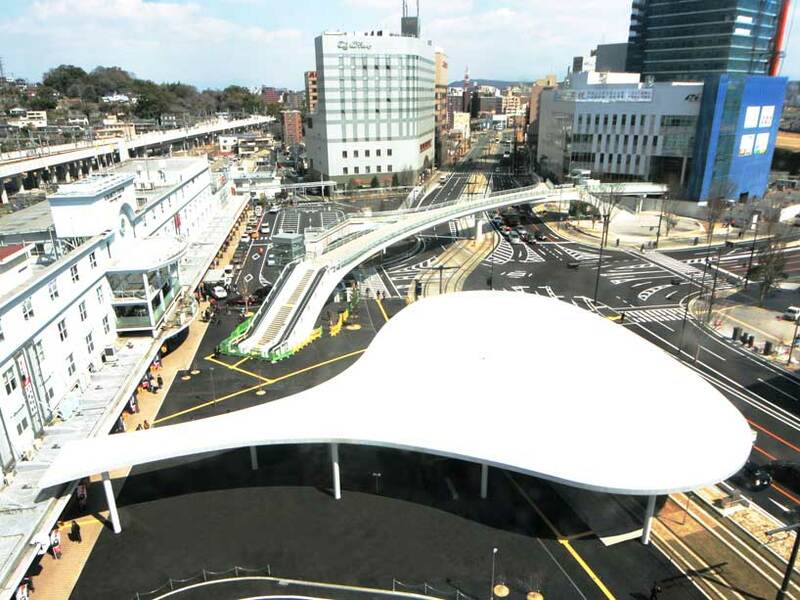 the project is part of a larger redevelopment of the station, which is expanding to accommodate the integration of the kyushu shinkansen high speed train. the design, which currently consists of one structure, attempts to generate a calming, park-like square where visitors can find ease in the complex environment that deals with mass transit. ultimately, the site will be composed of multiple roofs, all meandering and organic in shape, that will protect against strong sun and rain common in the region. the flat concrete roofs seem to float in the air, delicately hovering above the people and the landscape with the support of only a few simple pillars. the resulting image – derived from the flow lines created by the movement of both the vehicles and the people – is of cloud-like shapes that interact with each other and contrast the surrounding built environment. flexible and unstructured, the free-form curves allow for a certain flexibility that can meet the unexpected changes, existent in such a dynamic convergence of different functions. void of walls, the pavilion provides views in every direction, allowing the city to be seen in as a panoramic . using the city as a backdrop, the space appears to frame the activity and action which is taking place just beyond its protected perimeters. the negative spaces between each form will be filled with vegetation, helping to calm the bustling atmosphere and noisy surroundings. by inter-weaving these various components – protection, sunshine, nature – the design aims to create a rich public space which will eventually become an independent cityscape valued for its attributes. the final composition will be finished in conjunction with the rest of the station in 2018.
the end appears to approaching for nishizawa. This one looks heavy and the photograph from below completely alters the effect of the heavy band of concrete at the edge of the roof and makes it seems paper thin. Not very impressed… and to think, this is the same mind that brought us the incredible and poetic teshima art museum. It is as beautiful as the Teshima.